On Valentine’s Day, 2015, over one hundred people gathered at Cannon Chapel on the Emory University campus in Atlanta, Georgia, to celebrate the publication of the new Centennial Edition of Joseph Stephen James’s Original Sacred Harp, the 1911 precursor of our own 1991 Edition.1 The event brought together singers from Georgia, Alabama, and further afield, with an international group of scholars in Atlanta for the annual meeting of the Society for Christian Scholarship in Music. A fine singing, and an engaging first look at the new Centennial Edition, the day also gave a number of musicologists their first exposure to Sacred Harp singing, and provided an opportunity to reflect on how singers from generations past articulated the relevance of our tradition to their own times and places as we do so today in a rapidly changing Sacred Harp landscape. 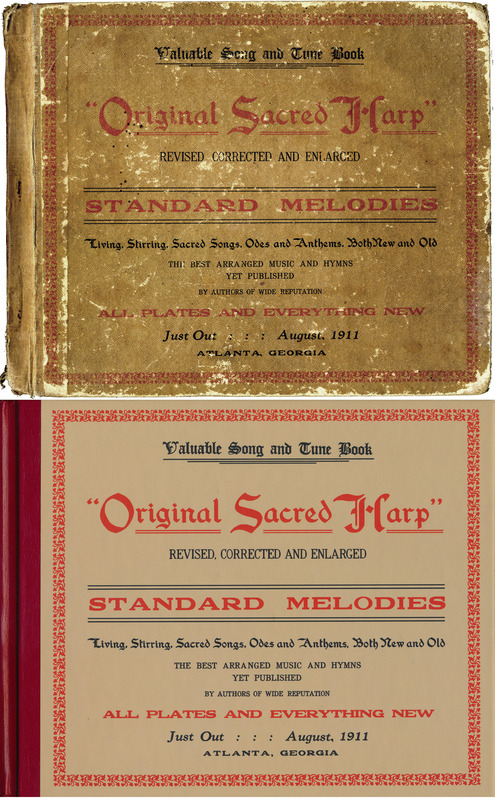 Front cover of the early twentieth-century second printing (top) and 2015 Centennial Edition (bottom) of Joseph Stephen James’s Original Sacred Harp. Top image courtesy of Wade Kotter. The Original Sacred Harp was published in Atlanta in the summer of 1911. The book was the third attempt at revising The Sacred Harp in the early twentieth century, following Wilson Marion Cooper’s and James Landrum White’s revisions (today commonly known as the “Cooper book” and “White book”). Rather than remove songs, as his competitors had, James retained all of the songs in the 1870 fourth edition of The Sacred Harp, the last edition co-compiler Benjamin Franklin White edited, and restored two thirds of the songs removed in the nineteenth century.2 James also added historical notes beneath every song (of dubious reliability and occasional humor), scriptural citations below each song’s title, and adopted the page layout familiar to singers today.3 The book’s “musical editor,” Seaborn McDaniel Denson, collaborated with his brother, Thomas Jackson Denson, and their children to establish the Sacred Harp Publishing Company in 1933 and begin the work of revising James’s book. Their Original Sacred Harp: Denson Revision went through additional enlargements and revisions in the 1960s and 1970s, and was finally revised once more in 1991 by a committee led by Hugh McGraw (now secretary emeritus of the Sacred Harp Publishing Company), resulting in the publication of The Sacred Harp: 1991 Edition. 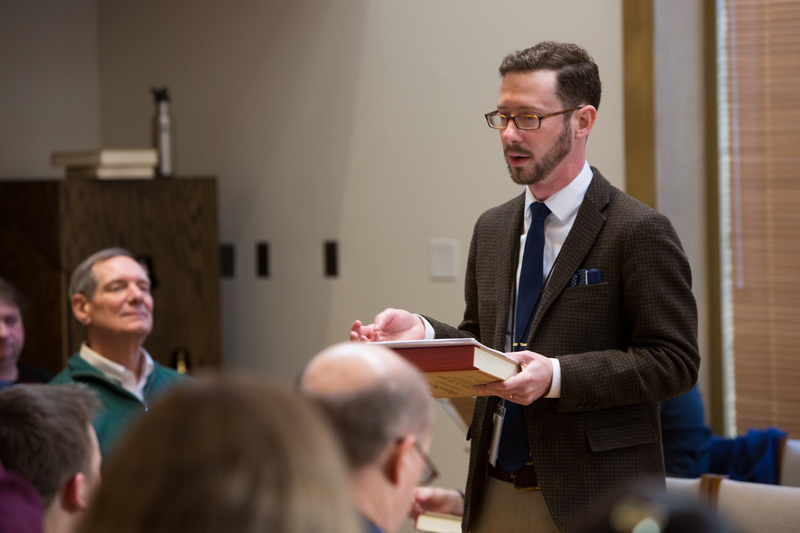 Jesse P. Karlsberg speaks about the history and design of Original Sacred Harp at the joint session of the Society for Christian Scholarship in Music and the Emory singing. Photograph by Mark Karlsberg. The joint session began at 9:00 am, an hour before the singing’s scheduled start time to avoid cutting into time for singing, with the two planned scholarly talks. A healthy contingent of conference-goers attended, joined by a number of Sacred Harp singers who had made the trek early to hear the speakers. My own talk on the history and design of James’s Original Sacred Harp followed a talk by musicologist and Sacred Harp singer Joanna Smolko on the contemporary Sacred Harp singing community in Athens, Georgia, and the early history of shape-note singing in the area. Joshua Waggener, Assistant Professor of Music and Christian Worship at Southeastern Baptist Theological Seminary, ably chaired the session. 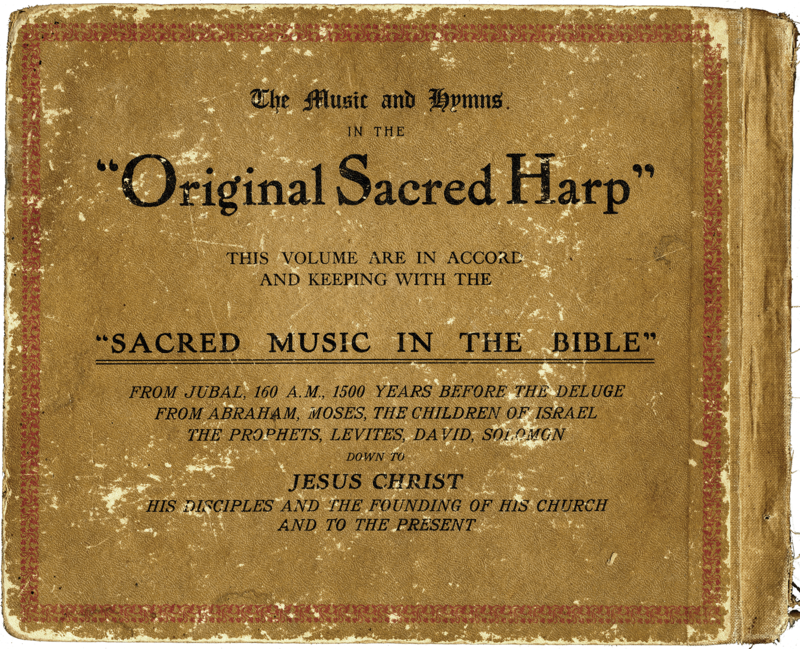 Back cover of Original Sacred Harp, second printing. Courtesy of Wade Kotter. After the talks, it was time to sing. 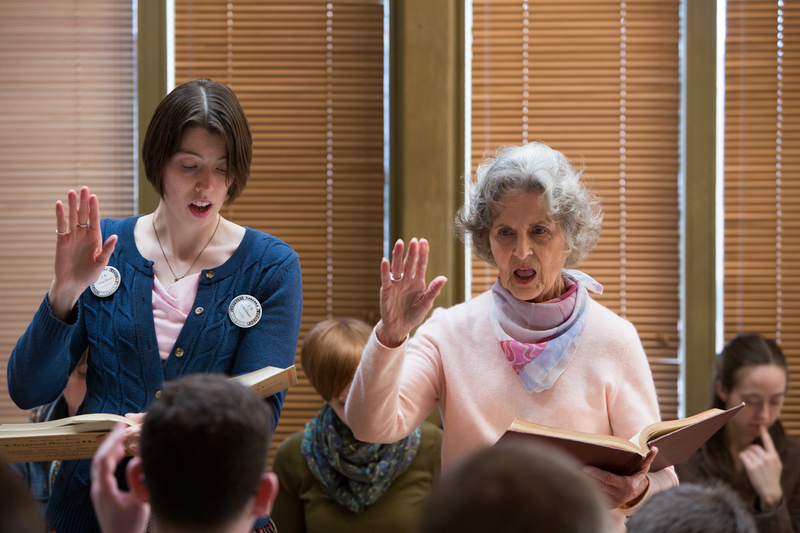 Lauren Bock, the singing’s outgoing chair, brought the class to order, and the next forty-five minutes served as a chance to explore the aims of Original Sacred Harp’s contributors and editors through the book’s music. We sang songs that appeared in Original Sacred Harp with newly added alto parts, songs restored by James after having been removed in 1870, and new songs introduced to the book written in hybrid styles that nonetheless remained within the stylistic boundaries of The Sacred Harp’s nineteenth-century editions. In between singing songs, I drew on these musical examples to describe how the revisers of Original Sacred Harp retained “standard melodies” associated with the antebellum past and added songs old and new they saw as in keeping with the music already contained in the tunebook, yet made some changes aimed at asserting the book’s twentieth-century relevance. Mary Brownlee and J. R. Hardman lead “Smyrna” from the new Centennial Edition of Original Sacred Harp. Photograph by Mark Karlsberg. At 10:45 the joint session of the singing and conference came to a close, but the Emory singing continued. The class decided to continue singing out of Original Sacred Harp until all those who wanted to lead from the new edition had a chance to do so. During this session Mary Brownlee, a veteran treble singer from the South Georgia Convention elegantly led “Smyrna,” a challenging song by William Billings in Original Sacred Harp on the unlikely page number “238A Continued” (another example of a mishap resulting from the book’s rush to print). As Mary told the class, the song was a longtime favorite of her singing teacher Raymond Hamrick, famously a fan of Billings’s music. Hamrick, Brownlee, and many other South Georgia singers primarily sang out of Original Sacred Harp into the 1970s, their community having rejected the 1936 Denson Revision because its editors removed a favorite song of leading area singer Plez Hardin. [Learn the story of this song and its composer, Elphrey Heritage, in the previous issue of the Newsletter.—Ed.] At around 11:30 am the class turned to our tried and true copies of The Sacred Harp: 1991 Edition, from which we sang for the remainder of the day. For a class that primarily sings from the 1991 Edition, singing from the James book was less of an exercise in sight-reading than many had expected. “Smyrna,” “The Great Roll Call” (pp. 25–26 in Original Sacred Harp) and “Jordan’s Shore” (p. 486), among other songs not in the 1991 Edition were new to many singers. Yet many other songs not only overlap with our book, the descendant of Original Sacred Harp, but are musically identical, featuring the same early-twentieth century added alto parts and the same legacy of editorial changes to certain notes. This renders singing from Original Sacred Harp a distinct experience for a 1991 Edition singer than singing from the Cooper and White books, where alto parts, and occasional notes, may stray from the familiar. Singers did find the book’s unusual size to be an impediment to use. With its eight by ten inch page dimensions and 609 songs, Original Sacred Harp clocks in at three and a half pounds, ten ounces more than the 1991 Edition. We marveled at the arm strength early twentieth-century Sacred Harp singers must have attained after regularly leading from the edition. 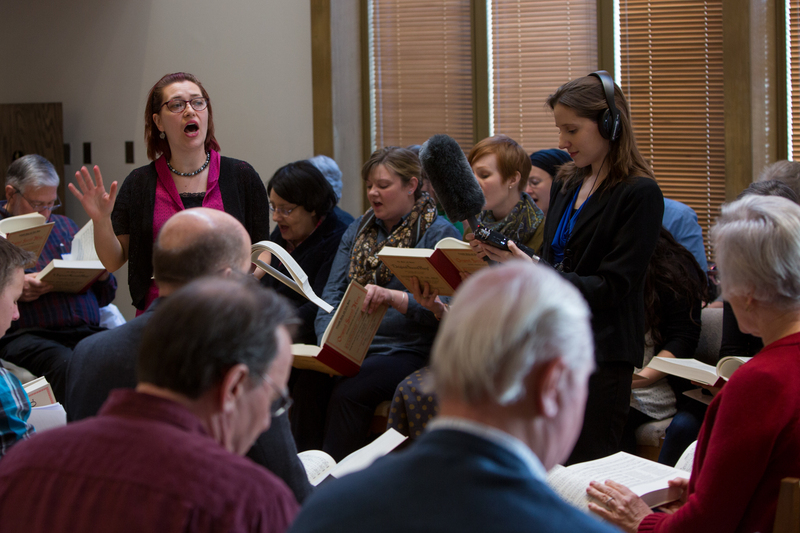 Lauren Bock leads at the Emory singing with reporter Amy Kiley, whose story on the singing and the new Centennial Edition aired on WABE 90.1, Atlanta’s NPR affiliate. Photograph by Mark Karlsberg. After a bountiful dinner on the grounds, at which singers were joined by a handful of conference attendees lured by the promise of southern cooking, the singing resumed. The impact of the larger than usual cohort of out-of-town singers present for the James book launch was evident in the volume and quality of the singing. A reporter from Atlanta’s NPR affiliate, WABE 90.1, periodically snagged singers in ones and twos during lunch and the after-dinner hour to speak with her about the event and their love of Sacred Harp singing while a photographer from the station snapped photos of the class. The resulting story placed the new edition in context and offered a picture of the singers, young and old, who make up the Atlanta Sacred Harp community.6 After the singing, a number of singers headed across the way to view an exhibit of hymn and tune books from the Pitts Theology Library’s Special Collections. Cases displayed first editions of many of the books containing hymns in The Sacred Harp as well as shape-note tunebooks and early New England tunebooks featuring the music of Billings and others. 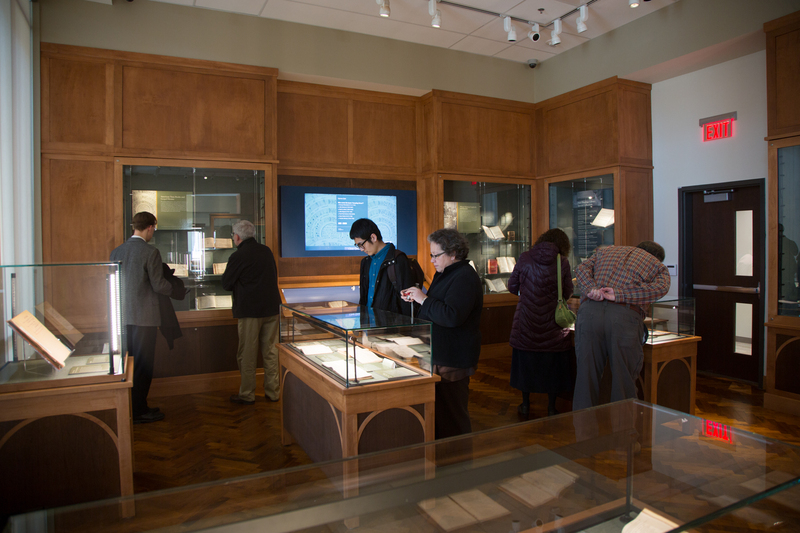 Singers peruse the Psalms, Hymns, and Spiritual Songs exhibit at Pitts Theology Library after the Emory singing. Photograph by Mark Karlsberg. Although the new Centennial Edition of Original Sacred Harp is primarily intended for research and as a collectible, it was satisfying for me, as editor of the volume, to see the book in singers’ hands and laps around the hollow square. Since the debut singing, a small number of local practice singings have devoted an evening to trying out some of the little-known songs in the book. No all-day singings are currently planning to feature the Original Sacred Harp, but those interested should keep an eye out for an announcement about this year’s United Sacred Harp Musical Association, to be held in Atlanta on September 12–13, 2015. The United convention passed a resolution authorizing the publication of the Original Sacred Harp when it met in Atlanta at only its third session in 1906 and we may use the new Centennial Edition, in honor of James, who co-founded the convention and then served as its president, for a portion of the singing this fall. In the meantime, singers can purchase a copy of Original Sacred Harp from the Sacred Harp Publishing Company website. At a moment when Sacred Harp singing is resurgent, spreading each year to new countries around the globe, we’re proud to make accessible once more a material representation of how Sacred Harp singing was remade in early twentieth-century Atlanta for a forward-looking populace in a new century. This entry was posted in Singing Reports. Bookmark the permalink.